Piedmont Middle School Lunch Program Serves Pop Tarts? I ran across an article on the SF Gate about school lunch programs and the new regulations to make them healthier. Piedmont Middle School is “featured” in the story, and described as “ignoring the regulations altogether.” Apparently, PMS serves Pop Tarts alongside some pretty greasy potato chips and Sun Chips. It’s the snacks that seem to be the worst offenders, none of the regular entrees were mentioned as outside the regulations. It also sounds as if the middle school and parents club are looking at changing the program, but aren’t there yet. If you go to the Piedmont Middle School website and read the weekly bulletin, the brunch and lunch items are listed and they don’t look out of line. The current issue also mentions the SF Gate article and that the school is in the process of examining the offerings. However, the Campus Life link has two pages on food options and prices, and even features a can of Sprite on one page (see Food Service and More About Food Service). I don’t think an occasional Pop Tart or some chips are the worst thing in the world, but I don’t think those are choices that should be part of a school lunch program. Read the article and see what you think. At the end, it has an overview of the law and what you can do to support it. Getting involved with the school parent club is probably the best way to make change happen. The consultant’s report on the General Plan Survey contains some very interesting data. The first thing that jumps out at me is that 51% of the respondents have lived in Piedmont for 21 or more years, while those folks only represent 36% of the population. It skews even higher if you go down to folks who’ve lived here for 11 or more years: they represent 72% of the respondents, but only 59% of the population. So the survey data does not accurately reflect the views of the newest Piedmonters, the ones most likely to have small children (and potentially the most to gain/lose in the process). Some interesting tidbits. 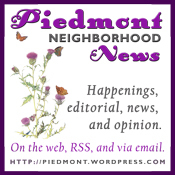 For 200 respondents, undergrounding is Piedmont’s top priority. 131 thought that a city-owned swimming pool was the top priority, 99 a teen center (this is adults mind you, not their teens) and 90 a central plaza/gathering place. Folks would support an increase in City taxes or fees (though how much is unclear) for a teen center, undergrounding, bike paths/lanes, a community gathering place/plaza, “free” WiFi (irony intended), additional recreational facilities, city arts and cultural center, and a city swimming pool, among others, but not for a civic center parking garage (a $4,000,000.00 waste of money that I’ll post about another time). Please note that the Chair of the Calendar Committee, Briony Bax, has announced that the date and time of the School Calendar Public Forum has been changed. It will now take place on Monday, October 22nd from 7-9pm at City Hall and will be filmed live by KCOM-TV and broadcast on Comcast cable channel 27. The event will be rebroadcast for two weeks following the event. Additionally, residents may borrow a VHS or DVD copy of the meeting from KCOM-TV after it has aired. Featured speakers will be Constance Hubbard, Superintendent of Piedmont Unified School District and Briony Bax, Chair of the Instructional Calendar Committee. Parents are encouraged to submit any questions about the calendar and the instructional calendar development process in advance. Please e-mail all queries and concerns by Tuesday, October 16th to piedmontcalendarcommittee@yahoo.com or mail them to APCP Calendar Committee, PO Box 11139, Piedmont, CA 94611. Please note that the purpose of this meeting is to review the Calendar Development process, the Committee’s recommendations and to hear parent input. This is not a meeting to announce the new calendar for 2008/09. Piedmont City Council is conducing a public hearing to consider field lighting for Coaches Field. The meeting is October 1st at 7:30pm 120 Vista Avenue. Two options are being considered. Staff reports are available on the city website. Send written commnets to aswift@ci.piedmont.ca.us or by mail to Piedmont City Clerk, 120 Visat Avenu, Piedmont, CA. The PUSD Curriculum Council meetings for the 2007/2008 school year will focus on the subject of math. Meetings will be held on the following Thursdays from 3:30-5:00 at PMS Multi-Purpose Room (note this change). Here are the dates: 9/27/07, 10/18/07, 11/15/07, 12/13/07, 1/17/08, 2/28/08, 3/20/08, 4/24/07 and 5/22/08.